The Ingrid Scarf is a perfect balance of clean simplicity with a touch of luxurious lacy edging. It is for those of us who like a bit of this and that. 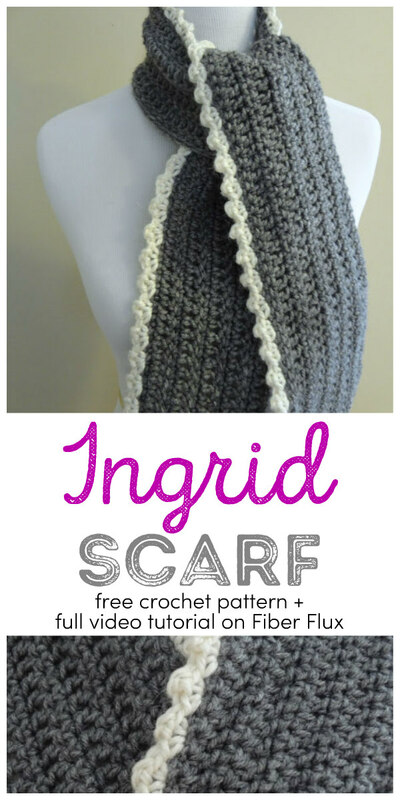 Have it all with this simple to crochet scarf with a super easy but beautiful scallop edging. The scarf body is worked with alternating single and double crochet rows to keep the mind engaged, but still makes for a relaxing and fun project. Width-Shown 5 inches wide (including edging), scarf can easily be made wider or narrower. Make a chain that is the desired length of your scarf, plus two more ch. Foundation row: Work a single crochet in the 2nd ch from hook, and each ch after. Row 1: Ch 2 and turn Work a dc in the first st and in each st across. Work a dc in the turning chain space to finish the row. Row 2: Ch 1 and turn. Work a sc in the first st and in each st across. Work a sc in the turning chain space to finish the row. Repeat rows 1 and 2 until scarf is desired width, ending on row 2. Tie on edging yarn of your choice. Chain one and turn. In the first stitch, (sc, ch 2, sc) all in the same stitch. Skip the next stitch. In the next stitch, work (sc, ch 2, sc) all in the same stitch. Repeat this sequence until you reach the end of the row. Fasten off. Weave in any ends that remain and you're all finished! Thanks Kathy! Your kind messages always make me smile and laugh!! Thanks again for your kindness...hugs! Thanks, I so love gray and cream together, it looks so wintry and elegant. I love this pattern! I am newer to crochet and had so much fun making this scarf for a dear friend. This one is a keeper for sure :) Thank you so much! Your patterns are so beautiful--thank you so much for sharing them so generously. I have given up trying to "choose" a favorite and have decided that the only solution is to keep your blog open at all times on my computer and simply start at the beginning and make everything. How can I possibly go wrong that way? You are so sweet...thanks for your kind comment, and happy stitching to you!! I love this scarf! The grey and the cream together works so well! A couple of years ago my daughter went travelling, from New Zealand she bought me a back a beautiful ball of 100% wool varigated yarn (one ball was all she could squeeze into her overstuffed backpack!) so I bought some 100% wool yarn and proceeded to crochet up a very similiar scarf in stripes - my rows are all double crochets. But I was never completely happy with it, until I saw yours and realised my scarf too needed a frilled edged! I've crocheted a scalloped edging all around it and I am so pleased with the result! Thanks so much for the inspiration! I definitely need to make yours now though! This is very pretty but I think I'd add the trim row on the opposite edge as well to make it look more even. I just finsihed this crochet scarf in a few days. Olive green with an off white edging. So stylish! A beautiful, simple pattern. found this pattern and love it. Started off with the grey and white. Am now make a lovely red and white one. Can you produce a pattern without the photos, to reduce the printing costs for those of us who understand how to crochet the pattern without the photos? Thanks. To reduce ink and paper use, I copy Jennifer's patterns and paste them into a Word file. Then I reduce the size of the first photo to remind me what the finished product looks like and delete all the other photos before printing. For the really short patterns, like this one, I just copy the main stitches onto a 3 x 5 card to keep in my yarn bag to refer to if I need it. Thanks for this pattern. So simple and easy, but elegant. I made it in chocolate brown and white, because that's what I had in scraps. I quite like it and it will keep me warm. Can't wait to make this scarf. Could you tell me what English wool I need to use please. Hi thanks for your question! The yarn I used is worsted weight yarn...if you can find the equivalent, it should work well. I would recommend doing a small swatch just to be sure. I can not print the instructions as the advertising runs down the right side of the page. Want to make it for xmas gifts, but will look elsewhere for a similar pattern. One thing you can do is highlight needed text, click your right mouse button and select copy, then paste to a Word document. That way you'll have only what you need, plus you can save it for later if you like. Hope that helps! Hello. this is day 2 for my crocheting experience and was wondering...on the double crochet tutorials it shows 3 chains when your turn your work to start a new row of doubles, however in your pattern you state to make 2 chains when switching from the single crochet row to the double crochet row. would you be able to explain the logic behind that so I know what I am doing is correct? I love the edging! I'm about to embark on this pattern. Thank you so much for the pattern. All your models are just lovely and I love their simplicity and how attractive they are! This is a beautiful scarf! So simple yet so elegant. Love the edging. I appreciate you sharing how you made it. Plan on making it for a Christmas gift ... Thank you! Hi there. Can you tell me how many chains to make to start with? I did about 250 chains, which i think is more than what is in the picture..i like scarves to be longer though :) 200 would work as well :) good luck! I just finished making this scarf as a Christmas gift for my mom & it is beautiful! I used a soft chunky weight yarn in grey for the body & aqua for the edging. Also I put edging on both sides. It is just so pretty. Thank you for this pattern!!! Jennifer, is the grey color the charcoal grey? The cascade regular grey looks too light. I really want mine to look just like the one in the photos. Please let me know so I can order this yarn. Thanks so much for the great pattern! I just wanted to thank you for all of your lovely patterns that you so kindly share. I haven't crocheted since I was a girl, but recently bought some yarn for a craft project and decided to give it a whirl. This scarf was my first project and I ended up making 4 of them! Then moved on to one of your cowls. And now I'm working on one of your infinity scarfs (but I ran out of yarn and had to order more...) LOVE your site! Your use of basic stitch combinations results in such unique and glamorous scarves. I also love the way you style them on the mannequin. I never know exactly what to do with a scarf once I have it on my neck. I will be trying out a few of your designs. Can I start the scarf with a foundation single crochet to give the edge a different look or do I have to stick to the usual chains? Very nice pattern! Thank you! this is a wonderful scarf indeed. i am a bigger in crochet work. i really liked it & i am really going to try it. Made two of these last winter as gifts ... they went over very big!!! I have finally completed my Ingrid scarf. I was a beginner in crochet...but after watching your videos I completely understood the pattern. I wish I could share a picture here. Thank you very much as u share your talent....i lv fiber flux. Hello, lovely pattern! Are these us terms? The DC is the Tr in UK terms? Thank you! Hoping you have a mittens pattern too, I'll be searching for one after my scarf. Great to find you, have a great one. I made this scarf as my first-ever crochet project. It was easy and it looks so nice! Just one problem: the scarf curls when I wear it--especially the corners without the scalloped edging. I tried putting a row of single crochet around the sides without edging, using 3 stitches in each corner, but it didn't help much. Any suggestions? Thanks! Jennifer I have a question. I have avoided LONG length crocheting because after I do my chain stitch my second row is always too loose so my crochet starts to go wonky and curve. How can I stop this? use a larger hook for my chain? Any help would be appreciated.